Dieses Wireless-System funktioniert so einfach wie ein Gitarrenkabel. Einfach ins Instrument und Amp einstöpseln, auf Sender und Empfänger den gleichen Kanal auswählen und fertig. Das B2 operiert im 2,4 GHz-Bereich, weit genug von Radio- und TV-Frequenzen. Die Latenz des Signals soll sich unter 5 Millisekunden befinden. 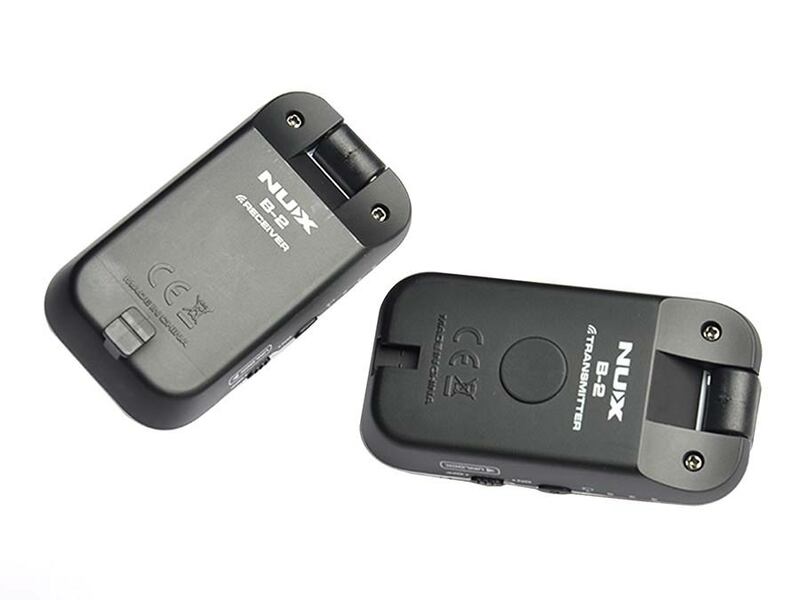 NUX B-2 is a digital wireless system designed for maximum compatibility for home or studio rehearsals. NUX B2 passed rigorous testing to achieve the highest signal stability and audio transmission quality hands-down. The last thing a guitarist needs is signal interference. B-2 uses the latest digital wireless format, it operates in 2.4 GHz range, far beyond any radio or TV interference, and its more than capable of safely handling your audio signal wirelessly. B-2 delivers 32-bit digital wireless sound quality and 48 kHz frequency response, so you wil hear your guitar tone in all of its detailed glory. And with a wide dynamic range of more than 110 dB, you will hear the full frequency range of your guitar or bass. 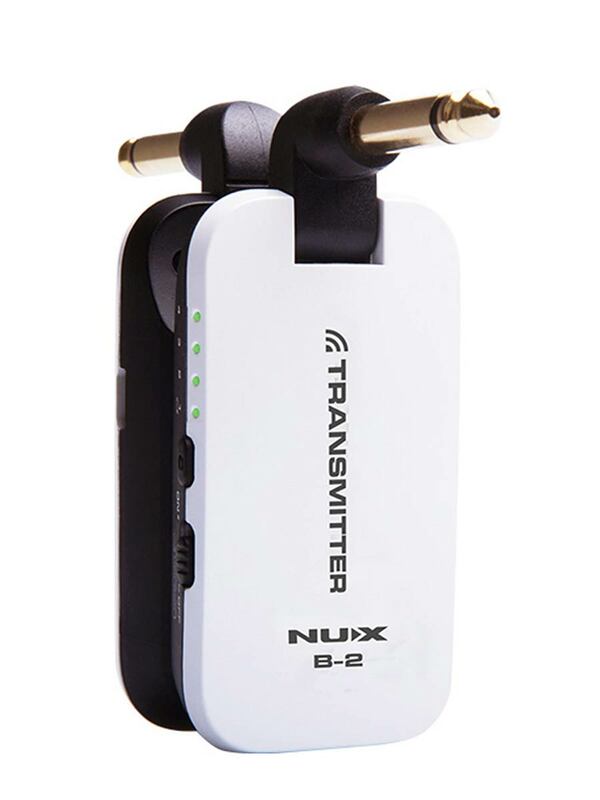 NUX B-2 delivers your instrument signal to your equipment just like a high-quality cable. NUX B-2 is always ready to go. 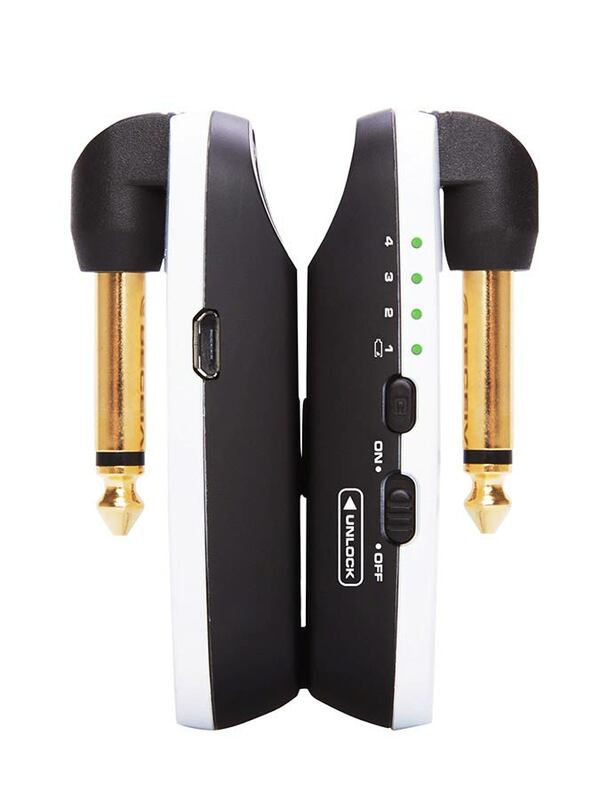 The Transmitter & Receiver both use built-in long-life batteries which can run for up to 20 hours (up to 6 hours of continuous playing time per charge). When you are not playing, B-2 enters Sleep Mode to extend battery life up to 20 hours. And when its time to recharge simply connect the USB cable (included w/ package) to the transport-coupled Transmitter/ Receiver. NUX B-2 guitar-friendly, Smart-Design Transmitter, means its jack has a swivel adjustment allowing you to duck the unit out of your playing field. Just plug in the 1/4 €� transmitter, and pair with the Receiver. The B-2 Transmitter works with all guitar types. It was designed to be compatible with the most popular guitars. You can configure the transmitter plug in two ways: facing downward to fit into the recessed top mounted inputs like Stratocasters* or facing other directions required for non-recessed inputs like the classic Les Paul* style. * Note: Stratocaster is a registered trademark of Fender Musical Instruments Corp., Les Paul is a registered trademark of Gibson Brands Inc.,Â which are in no way associated or affiliated with Nux Effects.